A Bulgarian businessman has donated an absolutely unique Ancient Thracian statue to the Archaeology Museum in Bulgaria's Black Sea city of Varna. The statue of the so called Thracian Horseman, also known as Thracian Heros, the supreme deity of the Ancient Thracians, was presented at a news conference in Varna Monday. The statue in question was donated to the Varna Archaeological Museum by a local businessman, Georgi Bonin, who found it in a house that he inherited from his family in the village of Brestovitsa, Plovdiv District, that he was clearing in order to sell it. 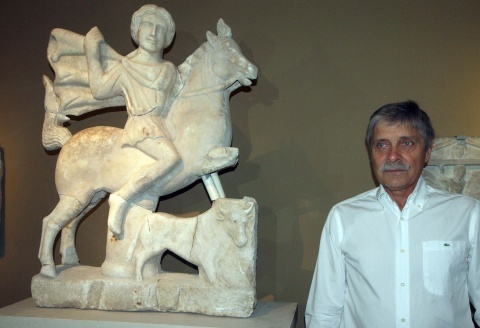 The Thracian Horseman statue, which is dated to the end of 2nd and beginning of the 3rd century, was discovered in several pieces, and Bonin took it to the Varna Archaeological Museum where it has been put together and restored. "When I found out how precious it is, I decided that the only place for this statue is in the museum," Bonin explained Monday, as cited by BGNES. "I strongly believe in positive examples and donations can have followers. Because people have now started to create private collections of antiques. I am convinced that the Varna Museum of Archaeology deserves to have this sculpture, and to present it in a dignified manner to its visitors from around the world," the donor said. The Thracian Heros statue has already been used to build a new special composition at the Varna Archaeological Museum, with an entire new hall now dedicated to Roman figurines. "This is only the second statue of the Thracian Horseman of such size that has been found in Bulgaria," explained Antiquity expert Alexander Minchev. "There has been only one such statue in Bulgaria, and it is kept at the National Archaeological Institute Museum in Sofia. Varna too has its Thracian Heros now," he said. According to Minchev, the author of the Thracian Horseman sculpture was a talented sculptor regardless of the tighter proportions. The sculpture presents the Thracian Horseman on a galloping horse, over the figure of a bull. "It is charged with lots of movement and emotion. I think this is the best religious work of art of this type from the period of the 2nd-3rd century," the expert explained.